With summer winding down, I’m scheming about what to knit next for a fall sweater. The pattern Bly, which launched in Knitbits back in February, is one of my favorite designs from the last year—so versatile and wearable! Knit seamlessly from the top down, there is minimal finishing to do at the end. I designed this pattern to show off the fabulous new marled shades Berroco Indigo that launched with the spring 2016 collection. I love Indigo for cool evenings in the spring, summer, and early fall, but for cooler months I need something a little cozier. This week I’m talking about my top picks for yarn substitutions for Bly. Berroco Ginkgo is a silk wool blend with a two-tone effect that echoes the marl. This yarn is next-to-skin soft and perfect if you want to dress your knits up a bit—I’m day-dreaming about the shades Amber, Moonstone, or Pewter, but they’re all good! If you like the idea of a wool-silk blend but your wardrobe preferences tend to be more casual, Berroco Artisan is a dreamy sweater yarn. The fibers have been given a good hard twist which results in a hard-wearing, textural 2-ply that has all the softness of silk with a more rustic appearance. This yarn is dip-dyed for a tonal effect so I do recommend working from 2 skeins and alternating every couple rows to avoid pooling. And then there is Ultra Alpaca—you can’t go wrong with a classic. Our beloved work horse yarn, a blend of 50/50 highland wool and alpaca, is available in 75 shades, 100g hanks. There is a reason this yarn has been around for 10 years now. Click here to see more patterns using Berroco Indigo, or here for more free patterns. Or sign up here for the Knitbits newsletter and have the weekly free patterns delivered right to your email inbox. Looks like a ice, simple design. Further investigation needed. 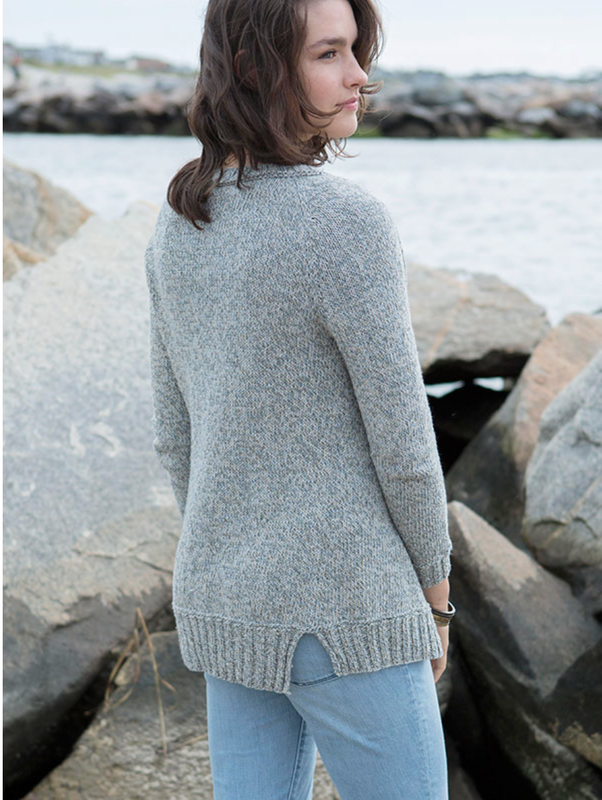 This is a sweater I need, looks like a good all-around garment…off to find out more on Rav. Thanks! Amy, I am having trouble with this pattern. Double checked errata, but it has not solved my problem. I put your pattern on Excel and did all the calculations, and have found that the pattern reaches 308 stitches for the size 43.5″ finished bust at row 57. That leaves me with 36 stitches (two neck and two raglan increase rows) unworked. I have double checked the PDF, my copy, and the transcription to Excel until I am blue in the face. What on earth am I doing wrong? This is SO UNLIKE ME! I’m very good at puzzles, so this has me completely baffled. Love the pattern and would so appreciate any feed back you can give me. Thanks for your question- I am forwarding your question to patternsupport@berroco.com for assistance. I’m not sure where the row 57 number is coming from but there is a problem with the pattern they will be able to help you and get the necessary errata available ASAP. NEED HELP to explain what to do. This has you working the shoulder of the cardigan and the neck at the same time. We have a blog post about working parts of a garment at the same time that may be helpful: At the same time. If you need additional clarification, please email us at patternsupport@berroco.com (be sure to mention that you’re knitting Bly if you send an email). OMG….I am having the exact same problem.! I don’t understand how you can to a raglan increase seven times and then every 4th row (in my case ‘5’). I understand the structure, but these instructions are very unclear and I really need some detail/guidance. Please email us at patternsupport@berroco.com with any questions! We try to keep all of our questions in one place so we can keep track of them. Thanks! Hi Ruth! Please email us at patternsupport@berroco.com for assistance with the pattern. Think I will have to frog it – shame. HI there,thank you for your response, I do understand the ‘at the same time’ terminology, I am particularly baffled by ‘every 4th row every 9 rows’ since the pattern doesn’t specify numbered rows, what do you consider to be the 4th row? Hello again! Every 4th row means exactly what it sounds like. For example, if you’re supposed to work a decrease row “every 4th row”, you would work that decrease row, then work three rows in pattern (meaning, if you’re working in stockinette stitch and the decrease row is on the right side, you would work the decrease row on one right side row, work one purl row, work one knit row, then work one purl row—that’s four rows completed). And then you’d work the decrease row again on the right side.